Benedictus (Song of Zechariah - Luke 1:68-79): Blessed be the Lord, the God of Israel; He has visited to His people and redeem them. He has raised up for us a mighty Savior, In the house of David, His servant. Through His holy prophets He promised of old that He would save us from our enemies, from the hands of all who hate us. He promised to show mercy to our fathers and to remember His holy covenant. 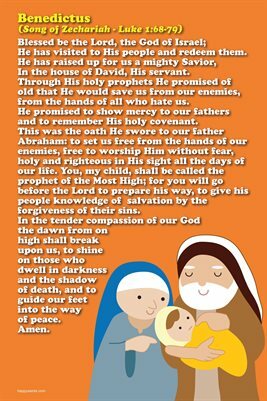 This was the oath He swore to our father Abraham: to set us free from the hands of our enemies, free to worship Him without fear, holy and righteous in His sight all the days of our life. You, my child, shall be called the prophet of the Most High; for you will go before the Lord to prepare his way, to give his people knowledge of salvation by the forgiveness of their sins. In the tender compassion of our God the dawn from on high shall break upon us, to shine on those who dwell in darkness and the shadow of death, and to guide our feet into the way of peace. Amen.